(On VHS, November 1997) Jackie Chan paired with Michelle Yeoh? Wowsa! This Hong Kong-produced comedic action movie takes more than a while to rock, but the final half-hour’s remarkable. Once again, Chan proves he’s got the right stuff, and Yeoh assumes a presence far beyond even the most capable Hollywood heroine. Among the movie’s biggest assets (apart from the two leads) is that it doesn’t takes itself seriously at all. 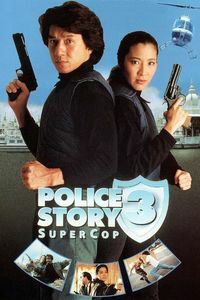 (Second viewing, On TV, June 1999) Jackie Chan and Michelle Yeoh in the same movie? Don’t look for me anywhere else but in front of my T.V. Screen! Upon a second viewing, Supercop is actually more enjoyable. For one thing, you get to expect the very slow pace of the first hour, and to expect the Really Good Scenes. Plus, you do get to appreciate the totally incredible Chan/Yeoh dynamic duo: Will there ever be a better onscreen action couple? The U.S. Re-release includes a quirky hip-hop soundtrack, in addition to the required bad dubbing.